Boring is a machining process in which a drilled hole is enlarged using a single-point cutting tool in an internal turning operation. Boring can be used for roughing or finishing an internal surface. Tolerances are generally held within ±0.002″ to ±0.0005″. Another advantage is that a boring machine features a spindle that advances out from its headstock, allowing the end user to reach into small cavities. “With a live spindle you have the opportunity to keep the tooling short from the cutter point to where it fixes to the spindle and you minimize tool deflection,” said Kenneth Campshure, director of sales for boring machine manufacturer MAG Giddings & Lewis, Fond du Lac, Wis. There are two types of boring mills, horizontal and vertical. On a horizontal machine the spindle is mounted horizontally and on a vertical machine the spindle is mounted vertically. The main difference between the two is that on a horizontal boring mill, the workpiece is stationary and the tool turns, while on a vertical boring mill, the tool is stationary and the workpiece turns. 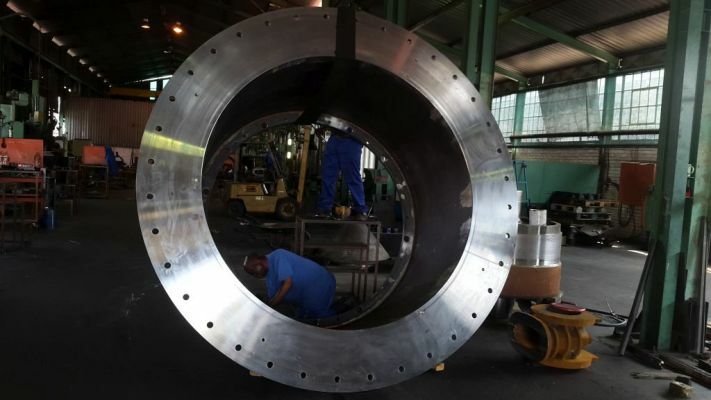 The shape of a workpiece will generally determine if a vertical or horizontal machine is used. Despite these differences, vertical and horizontal mills generally see equal amounts of use. John Ilczyszyn, owner of job shop Pride Machine Tool Inc., Melrose Park, Ill., has both types in his shop and finds it difficult to say which is more popular. “All of our machines are busy and we have just as much work on the vertical boring mill as we have on the horizontal boring mill,” he said.